Bringing 19th century coins to light! The new, completely updated and vetted edition of the Standard Catalog of World Coins, 1801-1900, offers comprehensive coin listings and current market prices from trusted coin experts from around the world. 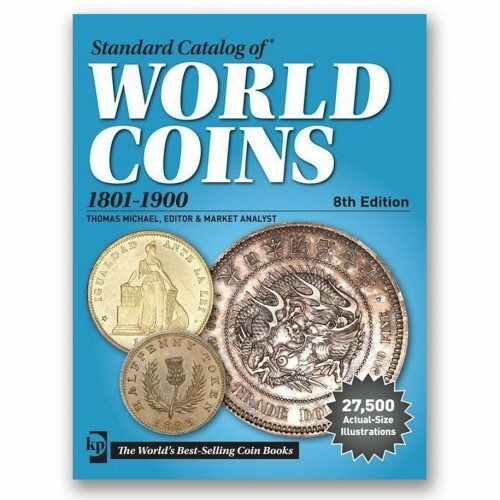 The ideal reference for researchers, collectors, auctioneers and dealers, the Standard Catalog of World Coins has a more-than-40-year tradition of excellence in the hobby. This 8th edition features significant coin value volatility for many countries. As the precious metals market stabilizes, the collectible coin market has sought to find reasonable levels in all areas. You will see major price gains in Mughal, Independent and Princely States eras of India, alongside many drops for German States minor type coinage, Swiss Cantons. Australian and New Zealand Tokens and many lower grades worldwide. Through many British Colonial countries you will witness expanded grades and increasing values on proof strikes.